I am new to yoga, and this is my second video in your beginner series. I enjoy very much how I feel after. However, I did have a difficult time with my balance on the lunges, and even took it back to not such a wide stance. I feel I have pretty average balance. I wonder if this is normal and/or if I wasn’t relaxed (or my mind too full to concentrate)? Just a thought. 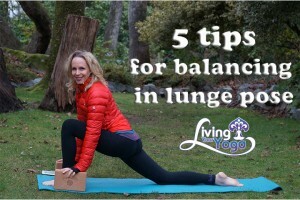 Today I am going to offer you 5 tips and two stretches for better balance in lunge pose. pay attention to your front foot: Your front foot is the basis of your support and balance. Check that your weight is evenly distributed between your inner and outer edge of your foot and between the heel and ball of your foot. Notice the four corners of your foot from the base of your big toe, to the base of your little toe, your inner heel and your outer heel. Notice if you are rolling in or rolling out on your foot. You want your weight to be evenly distributed side to side and front and back. Also while you are here, just double check that your knee is over top of your ankle. spread your toes: When you spread your toes you will have a wider base of support. 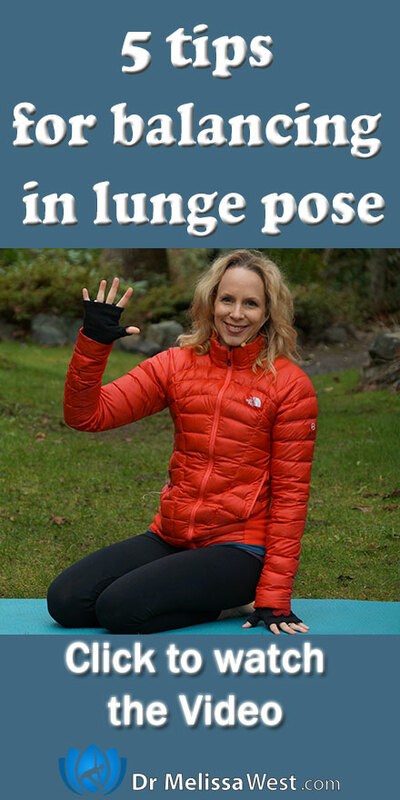 I am going to show you a toe stretch to help you spread your toes in lunge pose and any standing yoga posture for that matter. widen your base: The student from YouTube mentioned that they stepped back to narrow their base, however that made the pose shorter in length, which may or may not have helped with balance. One thing that will help with balance is to create more space between your left and right feet, that is to widen the base of your pose. use props: Finally you may find it helpful to place 2 yoga blocks on either side of your feet to help you with balance. Play with which side of the block makes it easiest to balance, however, having the largest surface area of the block on the ground is probably going to be most helpful for your balance.